Your insurance may not cover your expenses for emergency room or urgent care unless authorized by the on-call physician. For Prescription Refills, please call your pharmacy directly, and allow 48-72 hours for routine refills. Our highest call volume occurs between the hours of 8:30am to 10am, and from 4pm to 5pm. If you are calling regarding a routine appointment or non-urgent issue, you may choose to call after 10am and before 4pm to reduce your time holding on the line. New Patients : To schedule an appointment, please call our office at (949) 644-1025 during business hours. 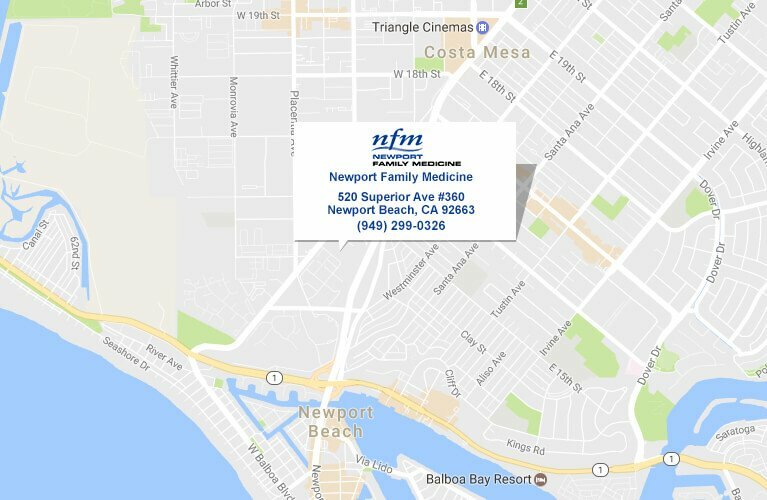 Or, you can email info@newportfamilymedicine.com. For your protection and to avoid a HIPAA violation, please do not include any personal or medical information in your email. We recommend calling our office if you do not receive an immediate response from us. Take PCH to Superior Avenue. Go North on Superior. Cross Dana and turn right into the second driveway and enter parking structure. Take the 55 Fwy South to Newport Beach. Turn right on 17th Street. Turn left on Superior. Take Superior toward the beach for approximately 0.5 miles. Make a left turn just past the parking structure and continue inside. Urgent matters: That cannot wait until normal business hours. Contact our on-call physician at 949-644-1025.